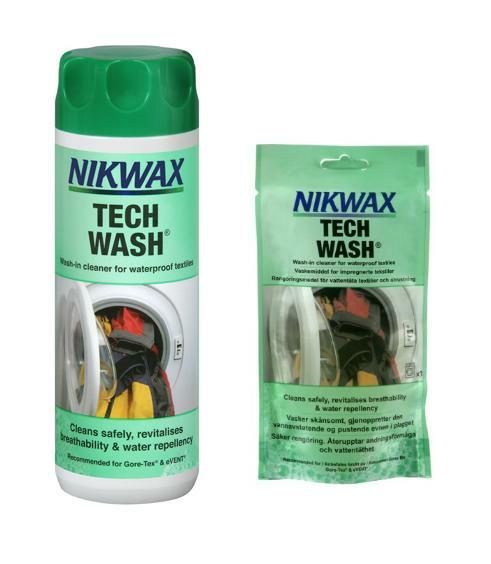 Nikwax Tech Wash is an easy to use, non-detergent, soap based cleaner that protects the water-repellent finish on waterproof and synthetic insulated garments like clothing, tents, awnings, marquees, rucksacks, panniers and camera bags. Tech Wash's gentle action lifts dirt and revitalises water-repellent finishes.. Ideal for Gore-Tex®, Ultrex®, SympaTex®, PermaTex®, Nikwax Analogy®, Entrant®, eVENT® and Triple Point®. Use neat Tech-Wash and either a sponge or a soft nylon brush to treat stubborn stains before washing. Remove all non-washable parts. Shake well before use. Follow care label instructions. Do not use detergents. There are currently no questions for Nikwax Tech Wash - be the first to ask one!